Out at sea, the crew of this Russian container ship noticed a sudden loss of power. Upon inspection below, they discovered the engine had thrown a conrod causing severe damage to the engine block. 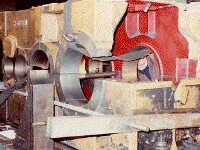 Fractured iron is removed, template is made to fabricate and machine two new cast iron inserts. New inserts fitted and installed. Stitching is in progress. Stitch repair and machining completed on the inserts. 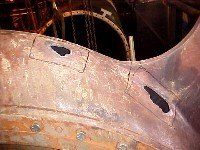 This repair took 16 days while the ship was under half speed, yet proceeding to its destination with a full cargo hold. Estimated engine block replacement would reach approximately $3,000,000 with three months of downtime. The repair was five per cent of replacement cost with no downtime.